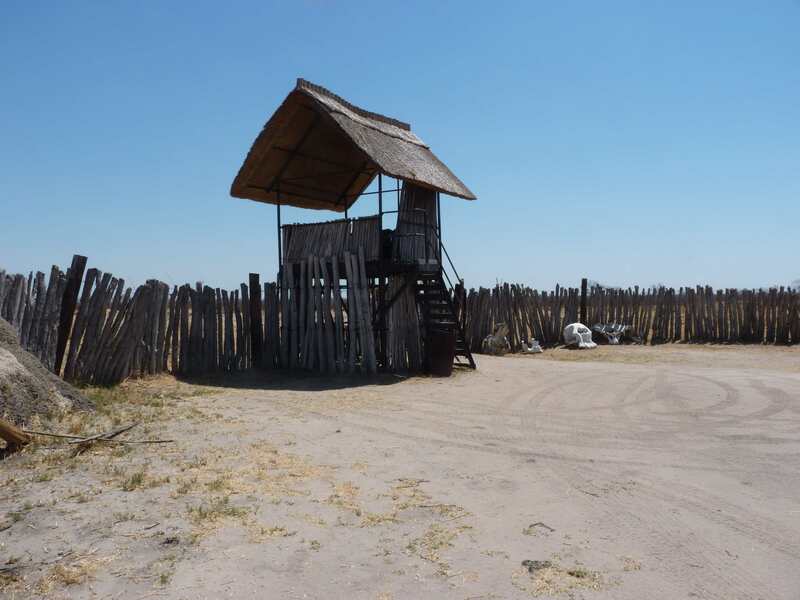 In Hwange National Park you are allowed to camp at picnic sites. The understanding is that you can have the place for yourself from 18:00 to 06:00 hours but other tourists can use the facilities during the day. This is not a real problem, as during that time you are outside the camp game watching. This was the case for us during the six nights we spent at the camp from the 11th to the 17th of October 2014. Things started off well! On arrival and about one km from Shumba, we met two lionesses moving through the bush clearly intent on their goal, as they did not even look at us. We watched them for a few minutes before they disappeared. It was a fitting start to our stay at a camp aptly named Shumba (Lion in the Shona language). 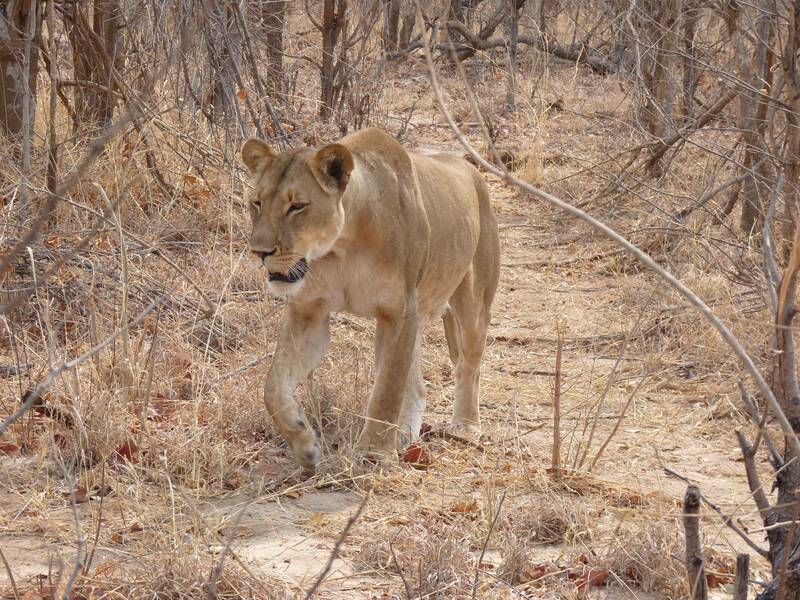 One of the lionesses spotted near the camp. Note how dry it is! We had chosen Shumba Picnic site after scouting a number of potential sites during our visit to Hwange last year. It is about half way between Main and Robbins Camps and somewhat removed from the main tourist area and it also had its own dam with permanent water. It was also shady, had good facilities and a Picnic Attendant looking after the place. The constant pump engine noise (located too close to the site) was particularly bad, especially when the wind blew from its direction towards us. 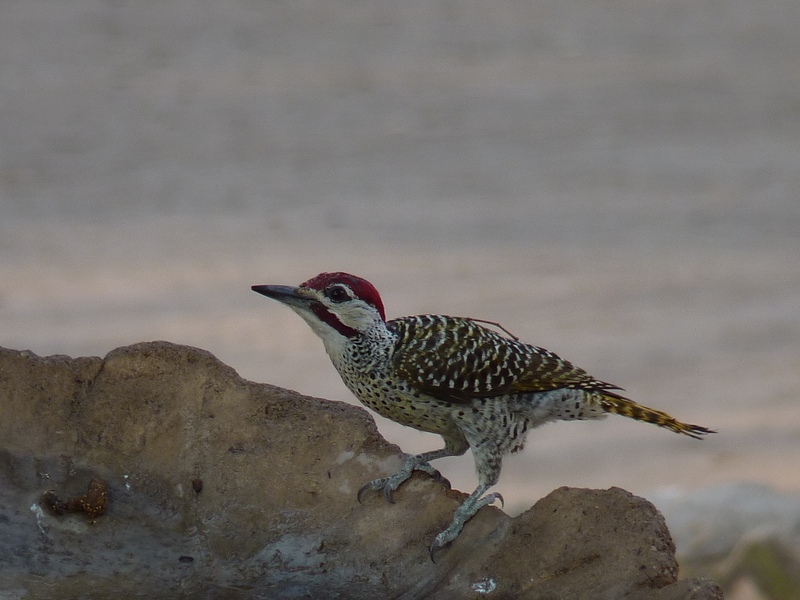 However, the availability of water close to the camp attracts many animals and offsets this annoyance. Among the animals seen were elephants, buffalos and zebra, with some elephants browsing very close to us on a daily basis. There is a small viewing platform at the dam from where animals can be watched in relative comfort and safety. On arrival, through the Picnic attendants, we learnt that the colony of Dwarf mongooses (Helogale parvula) that used to live in the trunk of the large fig tree (Ficus spp.) for a few years had moved away to another burrow nearby, outside the camp. This was disappointing, as I had come prepared for pictures of mongoose life at close quarters! 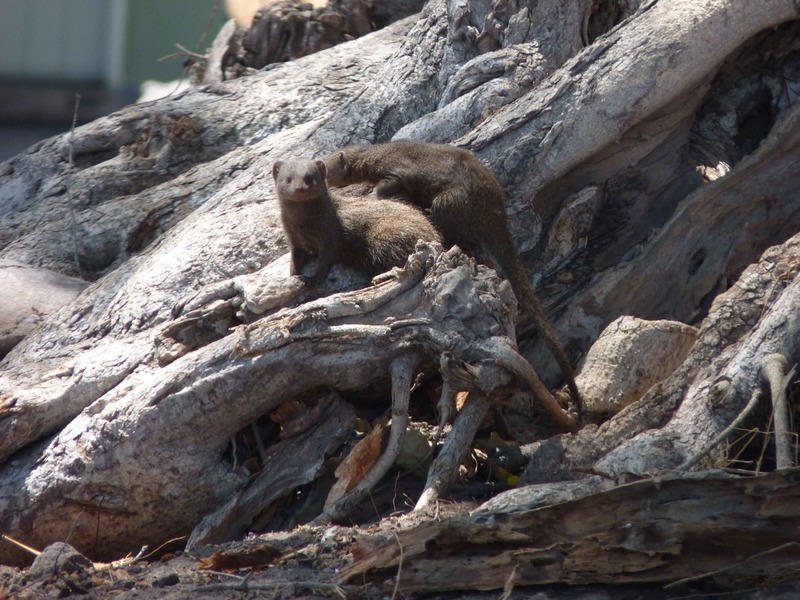 The Dwarf Mongooses seen in 2013. The area was extremely dry and the moment we filled the birdbaths, lots of visitors started to come, making me forget about the Mongoose’s absence. 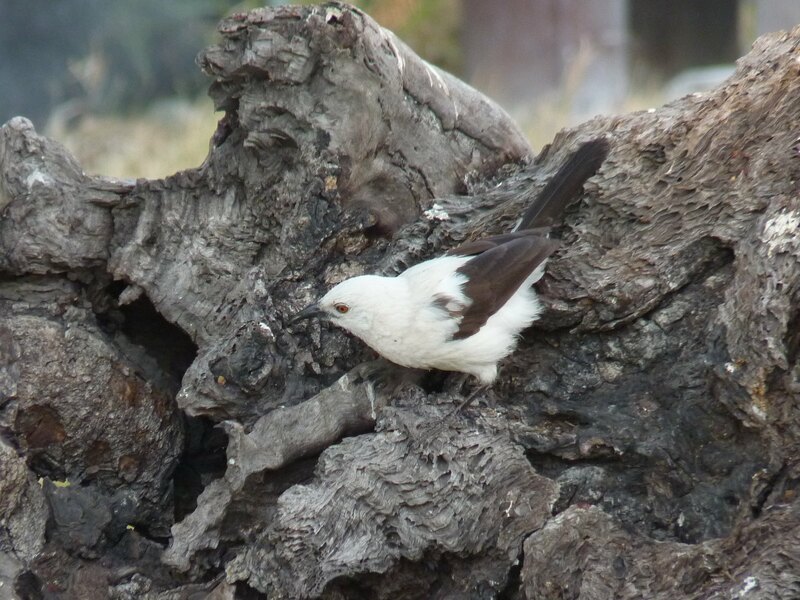 Apart from the ubiquitous starlings and hornbills we had a small flock of Southern Pied Babblers (Turdoides bicolor), a rare bird -near endemic- that I saw for the first time. 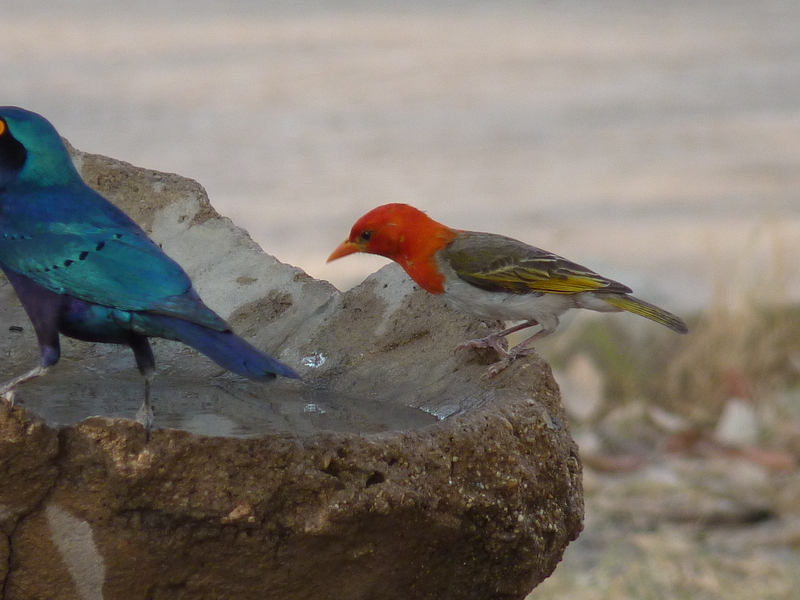 We also saw Redheaded Weavers (Anaplectes rubriceps) and what I believe to be a Bennet’s Woodpecker (Campethera bennettii), all drinking from the birdbaths. We set up our camp under a large African Ebony tree or Jackalberry (Diospyros mespiliformis), aware that the fence that at some stage protected the campers at the site was no more and all that remained were a few broken wires and posts. However, camping in the open was not new to us, as we did not have fences in Kenya! Apart from the fig and ebony trees, the camp also has Russet Bushwillows (Combretum hereroense) and a couple of Rain Trees (scientific name unknown). Although the dam at Shumba is almost your “private” dam, the flow of animals takes place mainly after dark, when mainly elephants come to drink. While this makes the nights entertaining from the “bush sounds” point of view, it is not easy to see the animals. believe me when I say that there was a lot of noise as elephant families and lone bulls interacted. Occasionally, elephants would be seen chasing each other and we suspect that some fighting also went on. We have seen evidence of clashes on our earlier visit in the form of chunks of ivory seen by the dam. 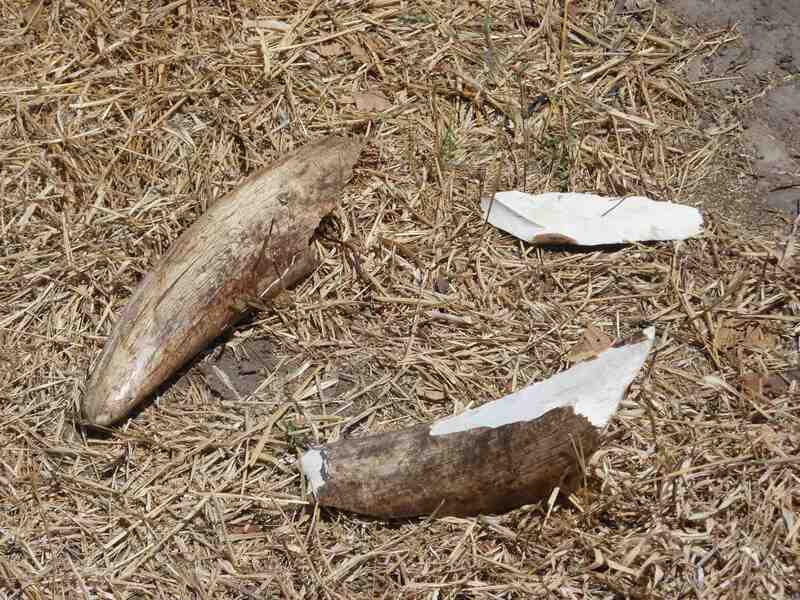 Broken tusks photographed at Shumba in 2013. For this reason, although we passed by “our” dam at every opportunity, our game searching forays took us to other dams such as Masuma, Deteema and Mandavu where animals can be seen during the day in larger numbers. The latter, a large dam, had a bush luxury if you wish to keep in touch with your offspring: a spot with cellphone signal! 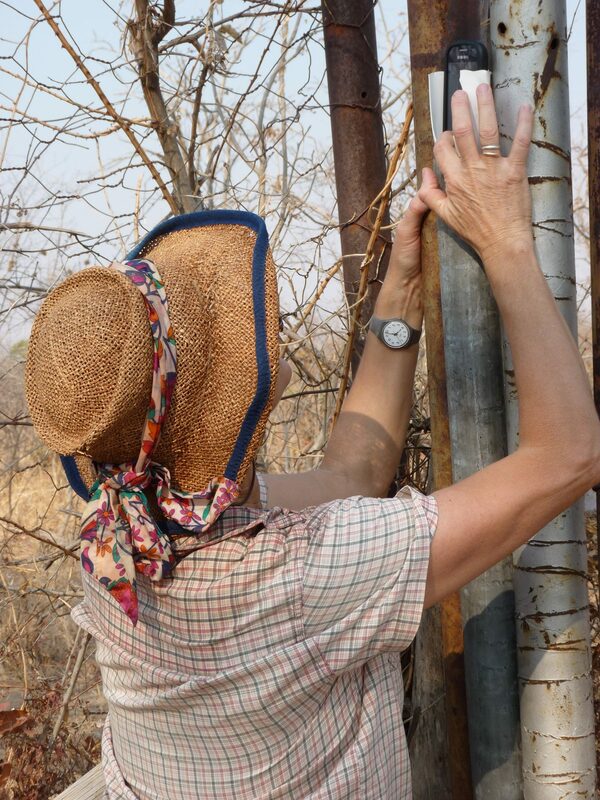 It was not under the Jackalberry tree as it is in Sirheni Bush Camp in Kruger National Park but exactly between the metal poles of a gate at the the picnic site! The telephone signal is found at a very precise spot, marked by a holder made of a plastic bottle! The first evening at Shumba my wife heard a whistle coming from the trees when going towards the kitchen. 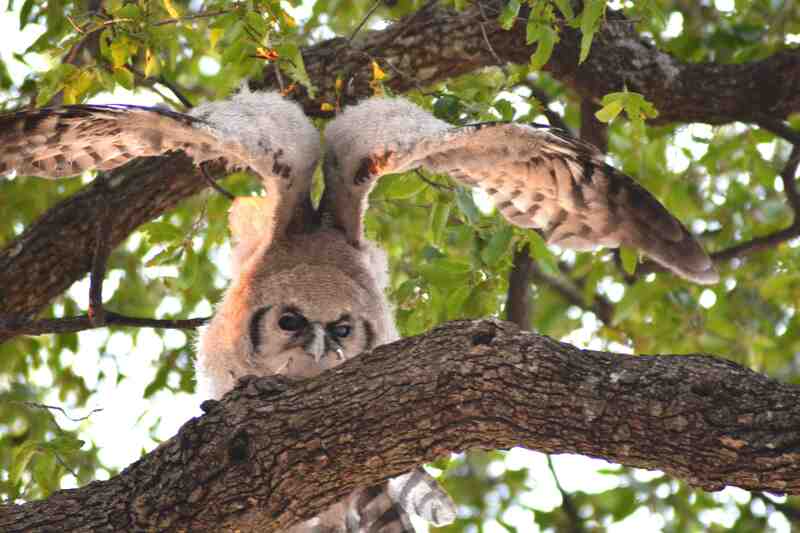 Subsequent search revealed a large owl perched on a high branch. As we did not wish to blind it with our torches, we refrained -with some difficulty- from trying to identify it further that night. Early the following morning the search for the owl took place and it was found! 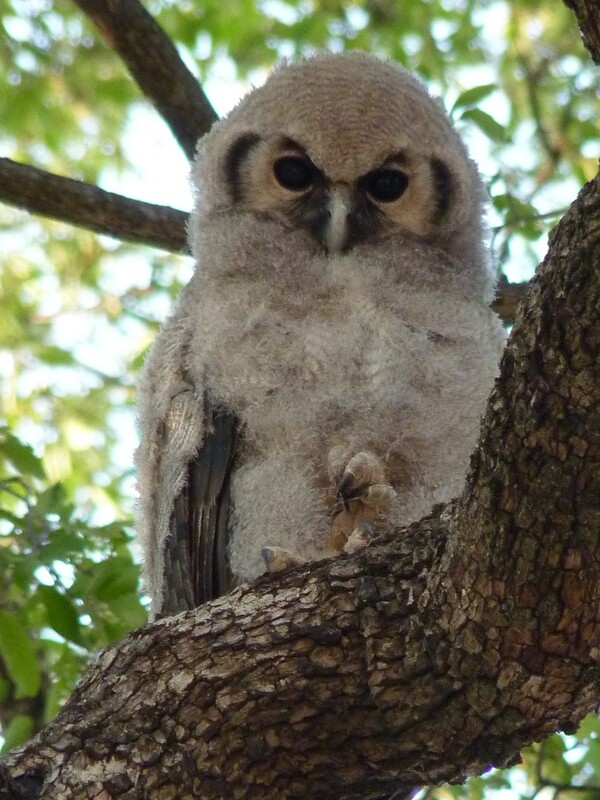 It was an immature Verreaux or Giant Eagle Owl (Bubo lacteus) that was clearly too young to fly and still confined to the trees in our camp. It was watching us! 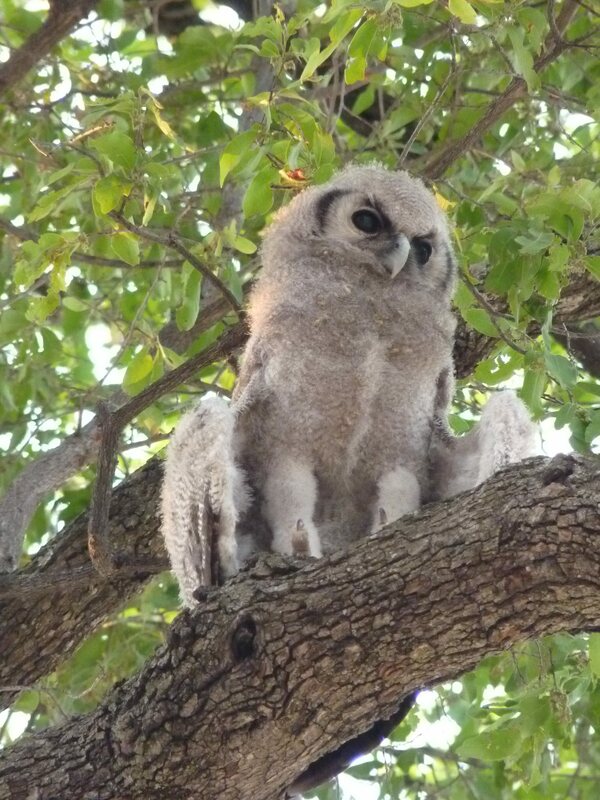 Our first sight of the owlet. Although it was already sizeable it still had lots of juvenile soft feathers. In marked contrast, its wings were already very large compared with its body and looked completely feathered by now. It did not move much and when it did, it walked and jumped between various branches or flew very short distances. It did not remain in the same place every day either and showed great interest in what we were doing. Taking good pictures of it was difficult as it was usually high up in the trees and against the light. The youngster was seen to lower its wings. Was it for heat dissipation or to rest them? The bird was there for the duration of our stay and it would be quiet mostly, whistling on occasion. We did not see it coming down to drink from the birdbaths or show any interest in the other birds. Said birds were not seen mobbing the youngster either. 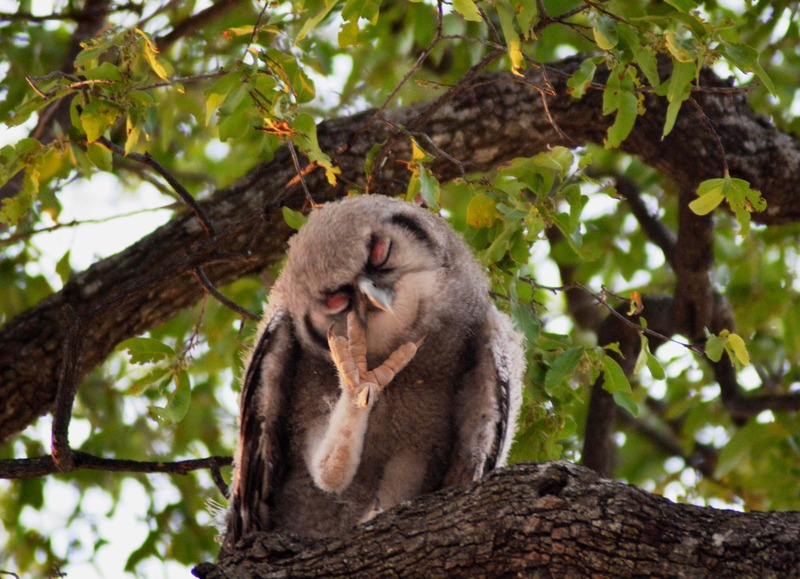 Upon further reading I learnt that the female owl lays two eggs and the first one hatching is the one surviving when food is not enough for two owlets. The new birds leave the nests at about two months of age and can fly two weeks after this. They remain rather inactive for three months after that and only start getting their own food after that time, at about five months of age. Probably the owlet we saw was still within the three months of “low profile”. The third morning I woke up earlier than normal, at about 0545 hs, and heard deep grunts like “hru, hru-hru-hru, hru, hru-hru” emitted continuously. Thinking that the young owl was calling I went out of the tent to see what was happening and saw an adult owl that soon flew off. I followed it outside the camp but lost it as it flew off. The parents were keeping an eye on our youngster! Later on we found a dead mole rat under a tree, a sign that the adult had brought food to the youngster! The mole rat was not eaten though. Friends came to stay with us on the fourth day after travelling from Harare to Shumba in one day! They arrived in late afternoon and rather tired so we helped them setting up their tent. This was easy as it is very easy to set it up. However, my sigh of relief was premature when the inflatable mattresses were produced. I felt obliged to offer my help with the hand pump. Hard work followed until; eventually they were had the required pressure. That completed, we spent the rest of the evening chatting and had an early dinner. Once in our tent, we noticed some night moves in the adjacent tent and some talking as well but we refrained from asking anything until the following morning as things calmed down after a while. Apparently one of the mattresses had suffered from a puncture(s) during an early safari by their children and it had deflated during the night with the result that one of our friends gradually “descended” to floor level and, subsequently, had a literally hard night! Spotting the young owl perched in a good place for photography made us forget the bad night and improve the spirits. My friend is a good photographer and had just bought a camera with the latest technological advances and took some excellent photographs that he kindly lent to me to illustrate this post. This was despite him not being very familiar with the camera that -as usual with modern gadgets- had a manual the size of the bird book! A great picture showing its diagnostic pink eyelids. Photo by Tom Milliken. Two days later, again during early morning, we had another visit by one of the parents that repeated the call described above. It was rather shy and did not stay too long, flying away after a short while. Later on we found what appeared to be a Teal on the ground, based on the plumage of its back. Further identification was difficult, as the head and breast of the bird had been eaten, presumably by the youngster. 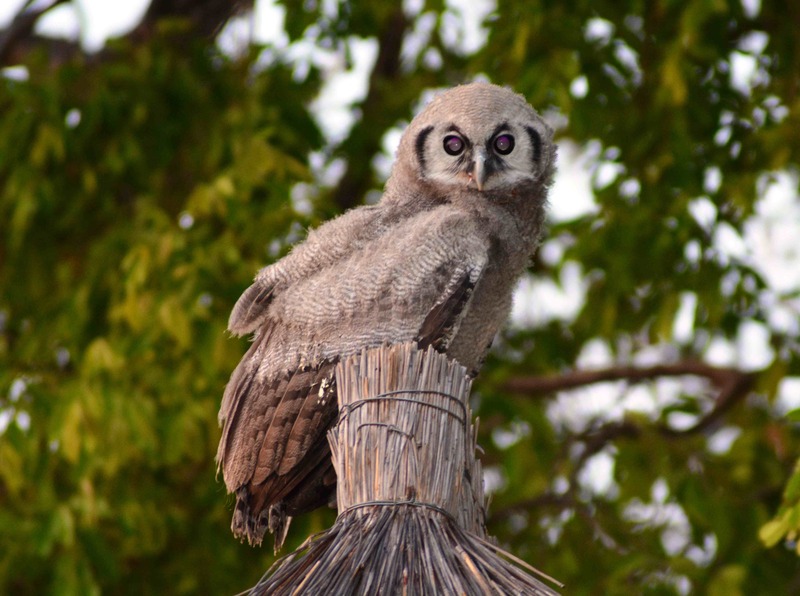 By the time we left Shumba a couple of days later, the young owl was starting to fly short distances and at some stage we thought it had gone. However, its whistling gave it away and we found it again, perched above our tent inside the tree’s foliage, probably seeking protection from the heat. We expect that soon the owl will become completely independent from its parents and start its own life. We hope to find its siblings next year! I do not wish to mislead you to think that I know about trees. Thankfully some forester placed nametags on the tree trunks. Unfortunately the Latin name for the Rain Tree was disfigured. Lots of observations and many animals to be seen here : a very nice post!